Pre Inca Paracas mantle 200 A.D. According to the mythology of the Amazon, runamula is the soul of a sinful woman, into action by evil spirited mule, half mule and half woman creature. Ya se ha Muerto mi Abuelo. El Hijo de la Runamula. Ya se ha Muerto mi Abuelo unplugged version performed by La Sarita. Pucallpa was founded in the 1840s by Franciscan missionaries who settled several families of the Shipibo-Conibo ethnic group. Juaneco Mix 1, 'Ya se ha Muerto mi Abuelo', 'Me Robaron mi Runamula'. The Shipibo-Conibo are an indigenous people of Peru. The Shipibo community consists of about 35,000 people living in over three hundred villages concentrated in the Pucallpa region. Shipibo communities are mostly situated along the Río Ucayali and nearby oxbow lakes. In the pre-Spanish period, the Shipibo were only minimally influenced by the Inca empire, despite the proximity of the Shipibo to the great Inca cities. Ayahuasca ("Spirit vine" or "vine of the souls": in Quechua, aya means "vine" while huasca or "waska" means "spirit") is any of various psychoactive infusions or decoctions prepared from the Banisteriopsis spp. vine, usually mixed with the leaves of the Psychotria bush. It was first described academically in the early 1950's by the late Harvard ethnobotanist Richard Evans Schultes who found it employed for divinatory and healing purposes by Amerindians of Amazonian. The Tragedy of Juaneco y su Combo On May 2, 1977, after playing a Labor Day party, most of the band was flying back to Pucallpa on a small private plane. The plane crashed, killing Noé Fachin, Walter Dominguez, Ediberto Vasquez, Jairo Aguilar, and Wilfredo Murrieta. Juan Wong Paredes, singer Wilindoro Cacique, timbalero Rosendo Hidalgo, and conguero Juvencio Pinchi finished production on the band's last album and carried on with five new members. The Tragedy of Juaneco on May 2, 1977. Juaneco y su Combo, biography by 'Cuarto Poder'. Juaneco y su Combo: El Regreso by 'El Comercio'. Selected by the National Research Council Ad Hoc Panel, National Academy Press Washington. D.C.
Peru is home of 10 sites: City of Cuzco (1983), Historic Sanctuary of Machu Picchu (1983), Chavin (Archaeological Site) (1985), Huascarán National Park (1985) # Chan Chan Archaeological Zone (1986), Manú National Park (1987), Historic Centre of Lima (1988, 1991), 17 Río Abiseo National Park (1990, 1992), Lines and Geoglyphs of Nasca and Pampas de Jumana (1994), Historical Centre of the City of Arequipa (2000). Cesar Paucar is a classically trained Andean guitarist whose musical interests range from classical to flamenco, from Latin to folk. Cesar has just completed a third solo outing, entitled "De Amanecida" (At Dawn's Door) consisting of Peruvian music with the collaboration of several renowned Peruvian artists' such as Julio Tirado, Saywa, Lourdes Carhuaz, and Rose Guzman. A study of ancient reveals an interesting finding. The second phase of the research will analyze the DNA of the descendants. To confirm the ties that existed between the people of Lambayeque, Peru and citizens of other parts of the ancient world, Dr. Ken-Ichi Shinoda conducted during three years, a series of DNA analysis, with support from U.S. laboratories, under the coordination of the head of the Archaeological Project Sicán, Izumi Shimada. This is a mind map of Cultural periods of Peru used by some archaeologists studying the area. Most of the cultures of the Late Horizon and some of the cultures of the Late Intermediate joined the Inca empire by 1493, but the period ends in 1534 because that marks the fall of the Inca empire after the Spanish conquest. Click the figure below to see the kaleidoscope. The Coricancha (from the Quechua word Quri Qancha meaning 'Golden Courtyard'), originally named Inti Qancha ('Temple of the Sun') was the most important temple in the Inca Empire, dedicated primarily to Inti, the Sun God. It was one of the most revered and respected temples of the city of Cuzco. Click the figure below to see more detail. The Intihuatana stone, the 'hitching post of the sun' at Machu Picchu. Click the figure below to see more detail. 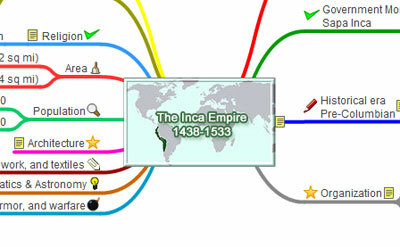 The Mind Map of the Inca Empire is an image-centered diagram that represents connections between various topics and concepts related to the Incas. Click the figure below to see the interactive mind map. The University of Pennsylvania Museum of Archaeology and Anthropology. Video Description: Machu Picchu 1950, Cuzco, Peru by Penn Museum, The University of Pennsylvania Museum of Archaeology and Anthropology. This is some of the earliest color footage of Machu Picchu in Cuzco, Peru taken in June and July of 1950. Paracas mantle 200 A.D. Larco Museum, Lima-Peru, and successive Golden Rectangles dividing a Golden Rectangle into squares.